"The world has to extract a price from Iran for its aggressive behavior," he added. Netanyahu told world leaders, diplomats and defense officials at the conference that the deal was similar to the infamous 1938 "Munich Agreement" that Western powers signed with Adolf Hitler in an attempt to stave off war in Europe, which became synonymous with appeasement. "Mr. Zarif, do you recognize this? You should, it's yours," Netanyahu said. 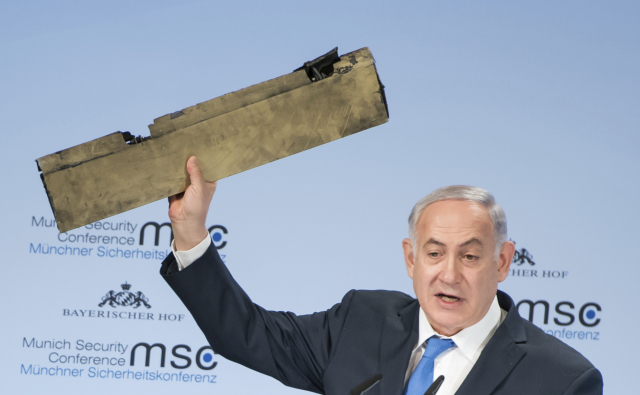 "You can take back with you a message to the tyrants of Tehran — do not test Israel's resolve!" Lebanese Defense Minister Yaacoub Sarraf accused Israel of being hypocritical, saying that he'd had "an Israeli drone above my head for the past 15 years" and warning about any aggression from its neighbor.